The thing about this recipe is that it includes butter in the dough. This makes it deliciously light and fluffy. The moist rolls also stay very well. 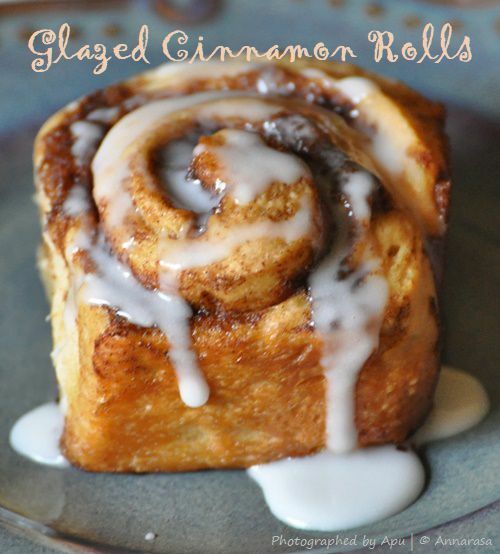 I save half the batch for the next day, and they were amazing warmed gently in the oven!! The beauty about this dough also is that it can be refrigerated overnight. Just place it in a greased bowl, and allow the first rise in the refrigerator overnight. Remove from the fridge and continue from Step 7. Warm the milk, add the sugar and yeast. Allow to proof. Blend in the butter into the proofed yeast mix. Sift all the dry ingredients together - flour and salt. Mix well to form a soft and pliable but not sticky dough. Place the dough in a well greased bowl. Cover and allow to double, about 1 hour. Prepare the filling. Melt the butter, stir in the sugar, salt, and cinnamon powder. Mix well. Punch down the dough, divide into 2 equal portions. Knead one part, roll out into a large rectangle, about 12" by 9". Using a small spoon carefully spread out the filling over the rolled out dough. Roll this into a tight cylinder. Cut into 1" thick slices. Place on a prepared baking tray, bout an inch apart. Repeat for remaining portion of dough and filling. Cover and set aside to rise, between 30-45 minutes. Next bake in a preheated oven for 30 minutes. Prepare the glaze by combining all the ingredients in a bowl. Pour over the rolls and enjoy. All content, text and photographs in this blog, unless otherwise noted, are Copyright of © Annarasa 2007 - 2017. All Rights Reserved. Kindly do not reproduce without permission.